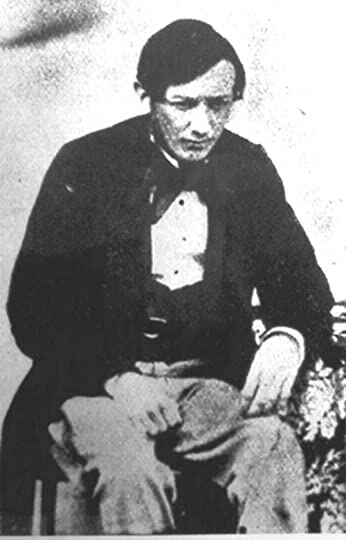 Herbert Coleridge whose brilliant life was too short. I was driving into work the other day thinking about Herbert Coleridge and realized that I might possibly be the only person on the planet driving to work thinking about Herbie. Of course, there are such a vast number of people on this planet that chances are someone was thinking about him. Perhaps some Coleridge scholar working on a dissertation on Herbert’s famous grandfather, Samuel Taylor Coleridge, or maybe someone thinking about the beginnings of the Oxford English Dictionary. Herbert Coleridge was technically the first editor of the OED and would have done a fine job, I’m sure, if he hadn’t caught a chill and died tragically young at thirty years of age. The reason I was thinking about him is because Simon Winchester mentioned him, and my quick research, before leaving for work, had been unsatisfactory in discovering how exactly he was descended from Samuel. He was not the son of one of Samuel’s sons so that only left the daughter Sara. Of course, my first thought was that she must have had him out of wedlock. I must formally apologize to Mrs. Sara Coleridge for thinking such scandalous thoughts. As it turns out, she married her first cousin Henry Nelson Coleridge. Herbert was very much a legitimate child. Though the idea of creating a complete dictionary of the English language was proposed in 1857. It was not until 1884 that parts of it were ready for publication. It floundered for decades under the weight of its own expectations. It wasn’t until the 1870s, when James Murray was asked to helm the project, that the possibility of achieving such a feat became a real possibility. Murray was a precocious talent, a true scholar who was, for the most part, self-educated. ”James continued to amass more and more knowledge, if only (as he would admit) for the sake of knowledge itself, and often in the most eccentric of ways.” We are living in an age of specialized knowledge, and too many people only read books or magazine articles that contribute to their specialized knowledge. Knowing something for the sake of knowing it has become such an outdated concept as to be considered odd behavior. 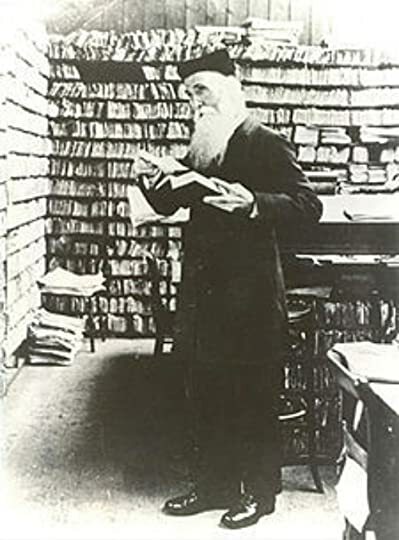 James Murray in the scriptorium built to house all the slips of paper coming in from his readers to compile the OED. Murray knew that this project was too large for the academic community to shoulder alone. He placed advertisements asking for help from the whole country. He needed readers who would notate words and the sentence they were used in. The system Murray developed to handle this influx of information is ingenious, and like most clever systems simple by design. 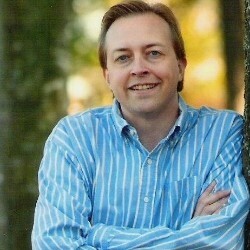 One of the people who answered his call for help was an American surgeon named Doctor William Chester Minor. 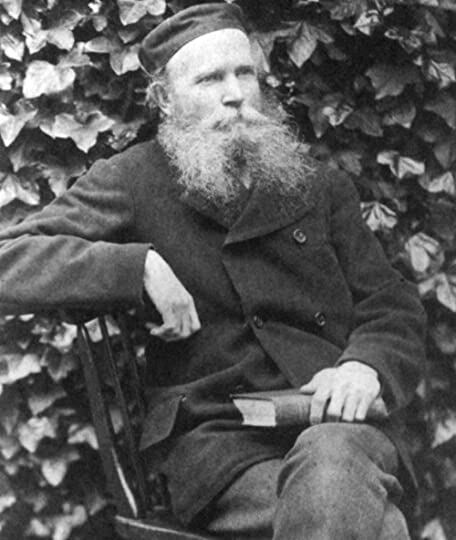 He became one of the largest, most consistent contributors to the OED. He had a lot of time on his hands given the fact that he was…”detained in safe custody until Her Majesty's Pleasure be known.” Doesn’t that sound lovely. I could almost believe that Minor is sipping tea and eating cucumber sandwiches while seated at a garden table at Windsor waiting for the Queen to have a chance to see him. Unfortunately, it is just a pretty way of saying he is incarcerated in an asylum for the criminally insane. As you learn the details of his life he was most assuredly dangerously insane with roots for this insanity going back to the time he served in the Union army during the Civil War. The roots went deeper, in fact back into his genetic history. His family was delicate mentally. They were bright and brilliant but like many hyper intelligent people wound too tight. They felt things too intently. Two of his brothers committed suicide. Minor was beset by twisted, shattered dreams involving Irish people trying to kill. He was a self-reproaching masturbator who also has vivid nightmares which fueled his already prodigious self-abuse. ”Men would then break into his rooms, place him in a flying machine, and take him to brothels in Constantinople, where he would be forced to perform acts of terrible lewdness with cheap women and small girls.” His delusions wrapped in fear bled dreams into reality causing him to misinterpret events around him. This all culminated in one final act which made it readily apparent that his incarceration was the only option left for society. It was the beginning of a beautiful friendship between the Madman and the Professor, without the added distractions of Ingrid Bergman or Paul Henreid. Though Minor was held in Broadmoor for the criminally insane, he had money and, therefore, could enjoy more luxury than the normal inmate. In fact, he rented a second cell, and that became his sitting room and library. He paid another inmate to build him beautiful, teak bookshelves. His wealth enabled him to also buy expensive antique books from bookstores not only in England, but from America as well. Considering the circumstances, he was beyond just comfortable, and if one can ignore the bars on the windows, you might even say he was pampered. 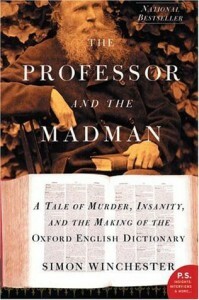 Working on the OED helped him focus his mind and probably kept him from spiralling deeper into his own misconceptions. The OED did not reach completion until 1928. Neither Murray nor Minor lived long enough to see the job done, but without their Herculean efforts the whole idea may have been relegated to another generation or maybe never completed at all. If we are fortunate, we find a worthwhile task to do while on this planet. Murray and Minor both found that task in compiling the English language. Winchester does a wonderful job of conveying the absurdity and the wonderfulness of these two men finding so much in common, despite one existing in the hallowed halls of academia and the other existing in the bedlam of an asylum. I once dated a young lady who owned a two volume boxed copy of the OED, which also included a small drawer on top for the much needed magnifying glass. It was an affordable way to own the twenty volume OED. I can remember spending many afternoons randomly turning pages and reading definitions of words I’ll probably never read in a novel or ever use in a sentence.